1. Time travel is such a complicated subject to grasp, what made you decide to write a novel based around this concept? But seriously, it wasn’t so much that I decided to write about time travel as that I had this idea begging to be written that happened to be about time travel. I have always adored time travel as a storytelling device, though, and I loved how it allowed me to write these really dense, complicated relationships by essentially having two different versions of my main characters running around. 2. How much research went into this book? Do you know anyone in particular that is working on a time travel machine? Ha! No (thank goodness!). I did do some research into the Large Hadron Collider – which is what the time machine in the book, Cassandra, is based on – but the bulk of my research was into various law enforcement issues, like the differences between the Secret Service and the Capitol Police and how different kinds of guns work. 3. You mentioned that you drew inspiration from three main sources. The relationship one is certainly interesting! Which TV shows brought about that theory? I’ve long had this theory about teen television, which is that the brother/best friend of the obvious love interest usually ends up being the better — or at least more interesting — love interest. I think this first dawned on me while watching Veronica Mars (because we allllll know how superior Logan was to Duncan!) but it pops up all the time, from old school classics like Buffy and Dawson’s Creek up to shows airing right now, like The Vampire Diaries. 4. How do you come up with certain scenes? Do you act them out with someone? I’ve never thought to try acting them out! I think that would be hilarious. Mostly I’m a muller. I’ve got the scenes constantly playing in the back of my head as I’m driving or making or dinner or whatever, and I keep tweaking them until they feel right. Then I write them down. 5. Are any of the characters based on someone you know in real life? Noooo, I think that way lies trouble! All the characters have tiny parts of their personalities or their lives that come from me, just because I think that’s unavoidable, but otherwise they’re very fictional. I do sometimes cannibalise parts of other CHARACTERS I like, though. Em, for instance, has a bit of Sarah Connor’s DNA in her, while Finn is a little Logan Echolls. 6. I know you’ve mentioned that casting certain actors in an adaption still flummoxes you, but you must have had someone in mind for each character while you penned the novel! Are there any specific actors that you think would really fit the characters? I genuinely didn’t have anyone in mind while writing the books! I know a lot of writers who need to have pictures or muses for their characters while writing, but I’ve never been one of those. I also used to work in casting, so I know that the best actor for the part is so often someone you don’t expect at all. When casting feels too on-the-nose (like when everyone immediately says she’s perfect for that! ), something fresh and spontaneous is often lost. Those two elements combined make me the worst fan-caster of my own books ever! Different scenes were difficult to write for different reasons. Probably the very hardest was the climax, from a strictly logistical point of view (oh my goodness, the pronouns!) and because it required me to keep a lot of characters’ motivations, relationships, and the way they intersected clear. Which, I think, is the way it should be. It was also one of most exciting to write. 8. What do you do when you’re stuck on a scene? Usually the first thing I do when I sit down to work is to write a brief outline of each scene I intend to write that day, including bits of dialogue, blocking, what I need the scene to accomplish, etc. Once I’ve done that, I rarely get stuck in the actual writing, because I’ve already worked through all the problems. If I get stuck writing the outline, I either try a bunch of different things in outline-form until one of them works or I set it aside and mull on it until my subconscious works it out. 9. What can your readers look forward to in terms of books in the future? Will you be starting a new series? Same genres or something different? 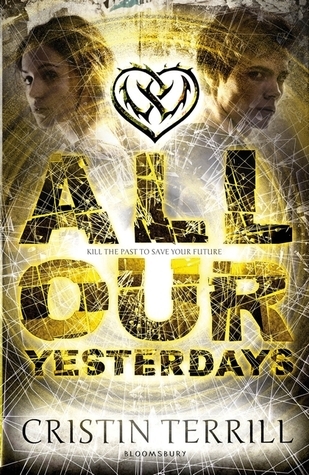 Up next is the sequel/companion to All Our Yesterdays, and after that, who knows! The book I wrote before All Our Yesterdays was a very quiet little novel about a girl living on a religious compound, so the ideas that grab me can be a bit all over the map! 10. What do you think of the age-old phrase “murder your darlings”? Never murder them! That’s just needlessly cruel and wasteful. Cut them out and paste them into a document called “Darlings” and maybe you’ll find a new home for them someday! Thank you so much for participating Cristin! I’m soooo excited to read your next book, I hope it comes out soon! Congratulations to CINDY, who’ve just won herself an ARC of the book. Look for my email in your inbox, and I do hope you enjoy the book as much as I did!